Traditions are a big part of many families. In my family, food has always been a part of those traditions. We had the same thing for dinner on Christmas Eve, Christmas and Easter growing up. My brothers insisted on the same birthday cake every year. We only recently introduced a new side dish at Thanksgiving (mashed potatoes, which Eric so skillfully makes). Whenever my mom deviated from those food traditions, someone in my family would pitch a fit. However the tradition that is called upon the most is one that has been passed down through three generations so far — our family pasta sauce recipe. 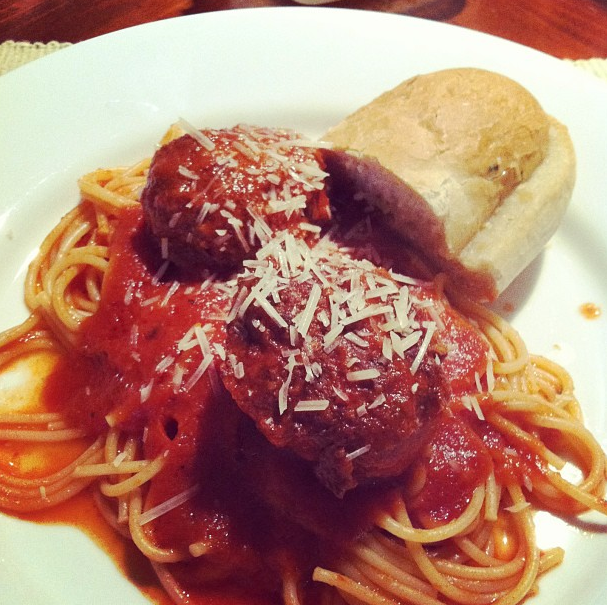 The sauce in action, served alongside homemade meatballs and garlic bread. My dad’s side of the family is Italian and having a family recipe for sauce (or gravy as some people call it) is usually a given. When my parents got married, my grandpa taught my mom how to make it and she has since taught me and my older brother how to make it. It isn’t the most complicated of recipes. It doesn’t have the most ingredients. But it is probably my most favorite thing to make, mostly for the memories it brings back. We’d always had sauce on Sundays. The smell of it slow cooking on the stove is what stands out the most to me. The combination of the onions and olive oil and the tomatoes and the spices, all mixing together to fill up the entire house. It is making my mouth water now just thinking about it. My mom would make a big batch of sauce one week and then freeze it for use in the time that followed. We’d have pasta one night, baked ziti another, then chicken parmesan. That sauce was the star of so many things. It would even add a little special touch to the holidays — lasagna on Christmas and tortellini on Easter. To me whenever I eat that sauce now, it just tastes like home. Now of course I’m not going to share with you the specifics of making the sauce. That would defeat the purpose of the secret family recipe. And truth be told, there isn’t even a set recipe. It’s mostly a feel and a look sort of thing, eyeballing how much of what goes in and the proportions. And as sappy as it sounds, the most important thing that gets put in to the sauce is love. I’ve made some tweaks in terms of the specific seasonings I use over the years. I personally think my sauce is pretty good…as good as my mom’s? I’ll probably never be able to say that for sure. But I have loved sharing the sauce with Eric over the past years and plenty of other friends and family. I can’t wait to share it with our future children and teach them the methods that I’ve been taught. And eat some delicious pasta. Last week, I posted about the hundreds upon hundreds of recipes I have stored on Pinterest and how I organize them. 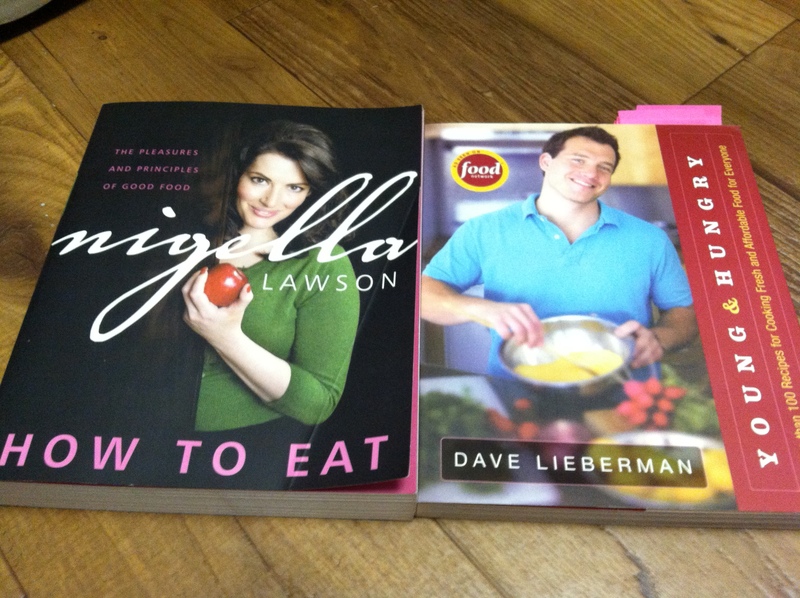 While I get the majority of ideas for what to cook via these pinboards, I still love everything about cookbooks. I can still remember the first recipe I made from “The Joy of Cooking.” It was orange and cranberry scones and I am pretty sure it didn’t turn out how I wanted it to. But that’s OK. Even back in the early stages of my love of cooking I realized that things didn’t always turn out perfectly. 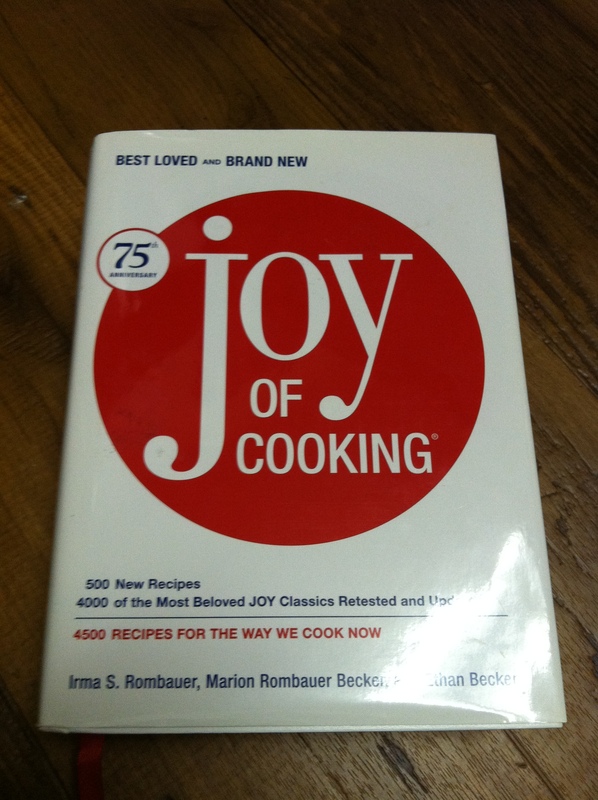 Since the fire was sparked with “The Joy of Cooking,” I have since added quite a few cookbooks to my collection. … 25 more to be exact. And I can’t stop buying them. 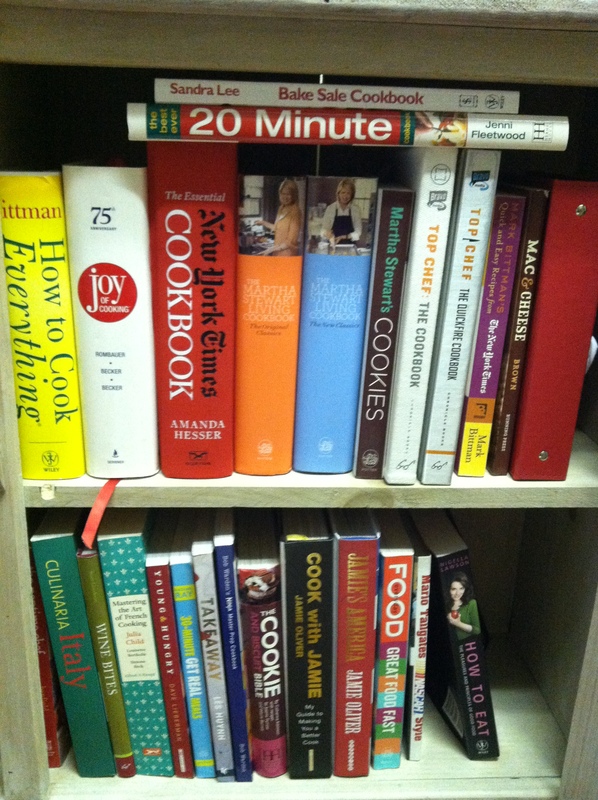 Whenever I go into thrift stores, I check out to see if there are any cookbooks I want to get. My Amazon Wishlist is full of tomes from the likes of The French Laundry Cookbook to Vintage Cocktails. My collection has moved with me from my college apartment in Athens, Georgia to four different places in DC and back to Georgia just this year — and moving books can be a pain. Literally. Now truth be told, I can’t remember the last time I’ve opened a few of these cookbooks, but there are definitely a few that have remained favorites over the years. If I had to pick out the cookbook I have used the most, it is this one. I have tried so many recipes out of it. It’s a great resource for fast meals. I think they came out with another volume that I have resisted getting for years. My favorite recipes are the Mediterranean Chicken Stew and Chicken Chilaquiles. 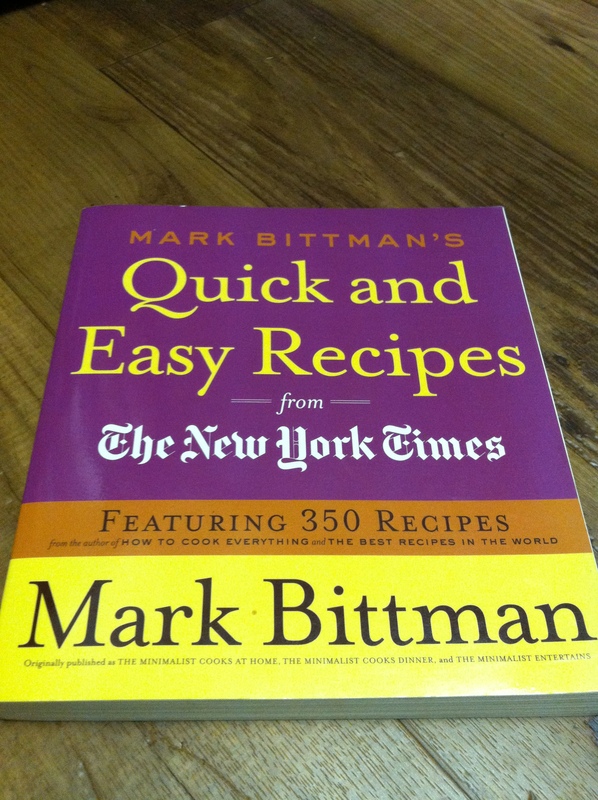 I have another cookbook fro Mark Bittman. He is a pretty famous food writer from the New York Times. Again with the previous cookbook, this has a bunch of quick and easy recipes which are great for weeknights. One of my favorite recipes is the paella. These are also well loved members of the collection. I have always loved Nigella Lawson (I’m sort of an anglophile so I am a big fan of her and Jamie Oliver) and this was the most approachable of her books at the time I bought it. Another book which features a lot of easy and quick choices. I loved Dave Lieberman. I am sad he is no longer on the Food Network. I got this book for Christmas and it includes one of my favorite go to recipes — garlic and rosemary chicken. Now I couldn’t talk about my cookbook collection without referencing this. 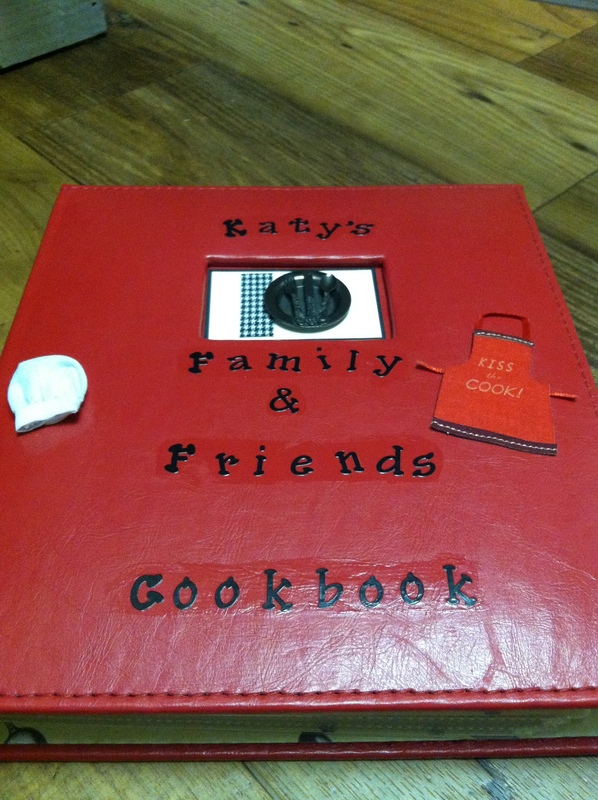 As a gift at my bridal shower, my mom made this book filled with recipes that were contributions from all my friends and family. It is one of my most prized possessions because it is filled with so much love from the most important people in my life. Eric and I take it out all the time and pick something to make and it brings back so many memories of the individual who shared the recipe. I am sure that by the time we settle down and buy a house, I’m going to have to have at least one bookshelf dedicated to my cookbook collection. And the thought of that is actually very exciting to me. TGIF! You know what that means? Time for another Friday Five! 1) A month or so back, we dined at this place in Atlanta called MetroFresh. It’s this restaurant where the menu changes every day and they feature fresh (go figure) and healthy food. When we were there, Eric got this buffalo tuna salad and it was ah-mazing. So I have been recreating it at home for lunches. So yummy. It’s super easy too. Take a can of tuna (I prefer to use the kind packed in water, not oil). Drain it and put it in a bowl. Put in a couple tablespoons of Greek yogurt (you could use mayo, but I use the yogurt so it’s a tad healthier). Then add whatever hot sauce or buffalo sauce you like. I actually prefer using the Kroger brand in medium. Just add to taste and it’s ready to go. I eat it with celery stick for the full buffalo experience. 2) A perk of working from home is being able to actually cook lunches instead of eating a sandwich or tossing a frozen meal in to the microwave. This week I’ve been on a big portobello mushroom kick. I made these Mexican-style ones from greenlitebites one day and a variation of these quinoa stuffed mushrooms the next. Both delicious AND nutritious. 3) One thing I wish we had registered when we got married was a nice quality Dutch oven. You know, like one of the Le Creuset ones or something. As I mentioned previously, I don’t do a lot of slow braising or anything, but I think a nice sized Dutch oven is always a good kitchen tool to have. I have been stalking TJ Maxx and HomeGoods hoping to find one at a discounted price, but I might eventually take the plunge (and one of the Bed, Bath and Beyond gift cards we still have from the wedding) and buy one before cooler weather stars. Le Creuset on the left. Lodge on the right. 4) I’m heading up to DC tonight for a long weekend. I AM SO PUMPED. Last time we were there was for a wedding in May and I came down with some sort of plague right when we got there, so here’s to hoping that doesn’t happen this time. On the agenda is a lot of time with friends and my favorite activity — EATING. I’m hitting up some of my favorite places to eat in the area and am so so excited: The Wine Kitchen in Leesburg (they have great food and excellent wine flights); Dairy Godmother in Alexandria (the BEST frozen custard. Obama went there once so it has the presidential seal of approval); Cheesetique in Arlington (the name says it all. A RESTAURANT THAT SERVES AMAZING CHEESE DISHES. I LOVE IT.) and of course Potbelly. Oh how I have missed Potbelly since moving to Atlanta. I’m sure there will be plenty of documentation on my Instagram so check it out if #foodporn interests you. 5) I was doing my grocery shopping at Kroger this weekend when I saw this book near the wine section. I promptly went home and ordered it off Amazon. 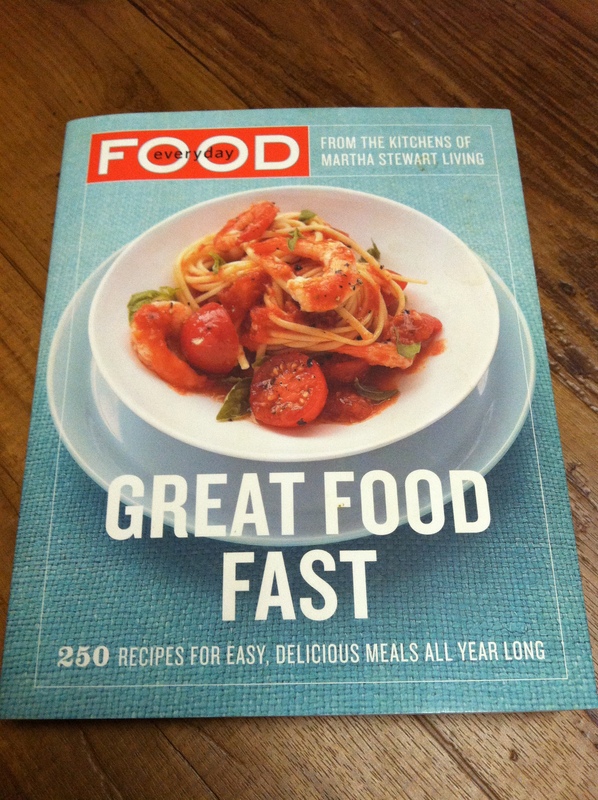 I am a huge book nerd so I love reading, and I especially love reading books about food. 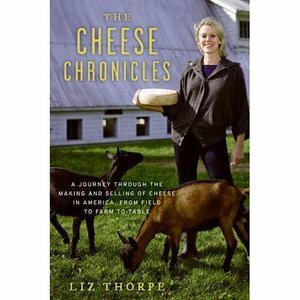 It just sounded like an interesting read (and I love, love, love cheese) so I’m hoping it was a good purchase. What were the highlights of your week? Share them in the comments. Summertime and grilling go together like peanut butter and jelly. Despite Atlanta’s recent streak of cool and rainy weather, I’ve still been craving grilled food. Until recently this was an issue as we did not own a grill. I would have to rely on going to a friend’s house or my parent’s to enjoy grilled delicacies. But not anymore. We recently just procured our first grill. Ain’t it cute? When we lived in DC, we shared a small one-bedroom apartment with zero outdoor space for any type of grill. Now in Atlanta, we have a little bit of a “patio” as I call is, so we took the plunge and got this little guy at Walmart. 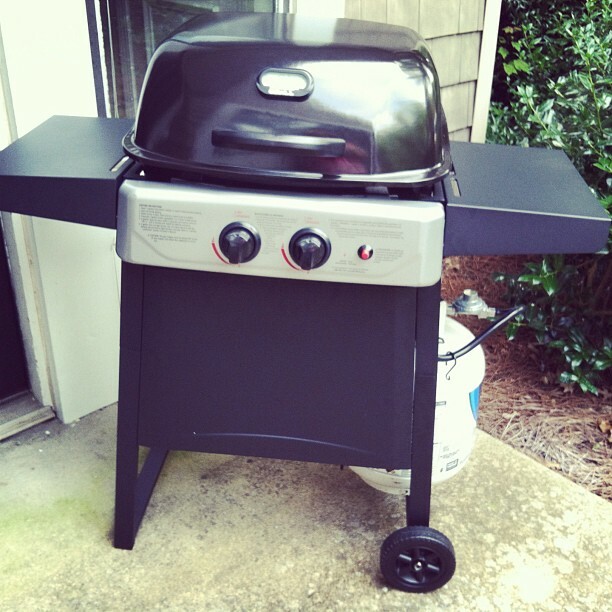 It isn’t the biggest of grills, but the price was right and it is just the perfect size for the two of us. This is where I talk about how I used to be scared to grill. I just never felt comfortable manning the grill. Maybe it was the propane gas or the flames, but I just never could get the hang of it. One place where I lived in DC had community grills for residents to use, and my roommate would go and grill out all the time. I would just watch her in amazement as she knew just where to put the meats and veggies to get the right cook. She never had to cut open a chicken breast to see if it was done — she just knew. She tried to teach me her ways, but nothing really stuck. The turning point this year was Father’s Day. I was over at my mom and dad’s house making brats and I had to ask my mom a million questions about if they were done, how hot should I make the grill, etc. So when Eric saw this grill at Walmart and said we should get it, I enthusiastically said YES. Now I am on my way to becoming a grill master. So far we’ve tried grilling steak, chicken, fish, hot dogs and sausage. Most things have been successful, others have not, but I’m sure we’ll get the hang of it eventually. Last night my parents and brother came over for a cookout to celebrate my dad’s birthday. We made burgers, something simple enough for a newbie. My mom (who is the one taking this picture) was a great teacher. She taught me to turn the grill up high and let it flame up so the burgers char a bit on each side. 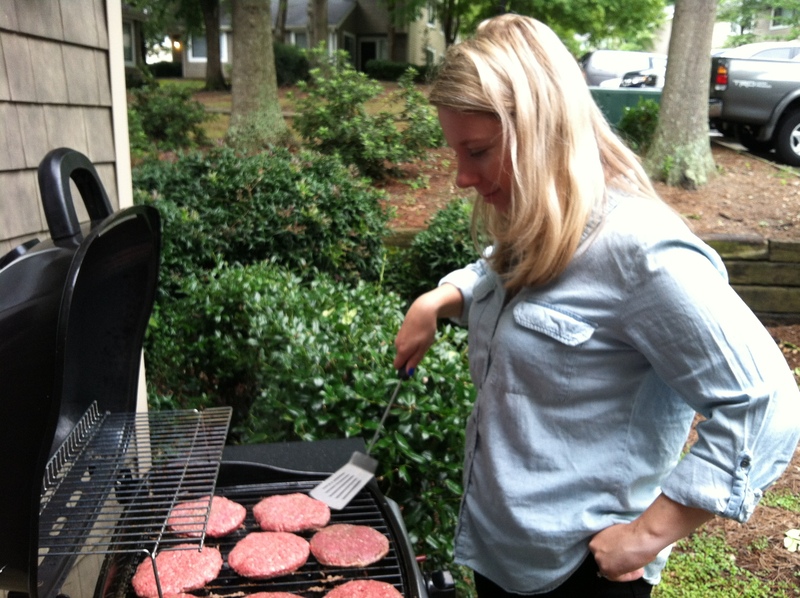 She showed me how to move the burgers around to take advantage of hot spots on the grill. She also gave me a tip for cleaning the grill (Next time you turn it on, set it to high and close the lid. This way all the stuff just burns off the grate). Overall, it was a great learning experience with delicious results. 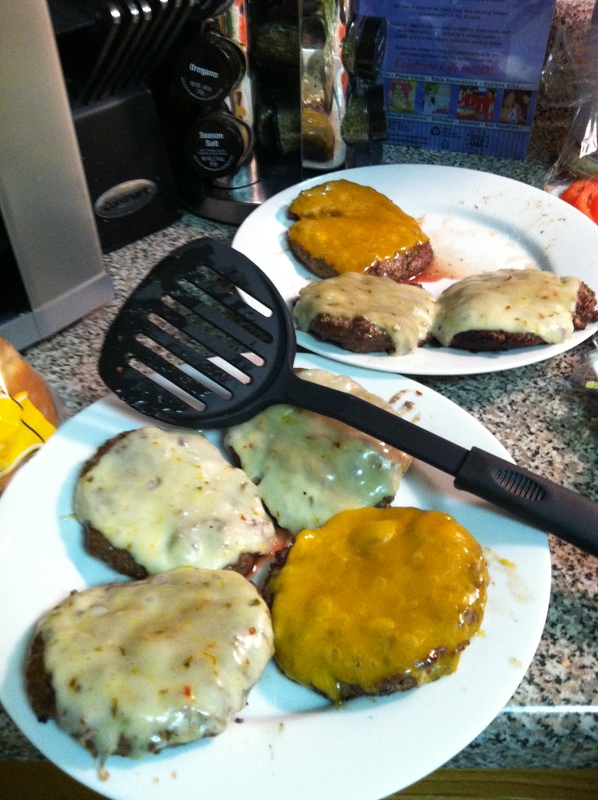 The finished product: burgers with cheddar and pepper jack. I’m not going to be participating in any grilling competitions anytime soon, but I am looking forward to continuing my grilling journey. I love routine. I have followed the same steps to get ready for bed for years. I love having things planned out. Hence why I am introducing a new weekly feature for Kitchen Casual: Friday Five. A few of the blogs I regularly follow wrap up the week with a post about the things they did for the week, what they are loving at the moment etc. It is just good to have a standing post one day of the week that is easy peasy. So this will be mine. Every week, I’ll write up a post featuring five things about food. It could be a recipe I want to try, a book I am reading — anything as long as it relates to food. I saw that now, but before you know it, it is going to evolve in to a random mess. But let’s start off on the right foot. 1) Trader Joe’s is this magical land. You enter and discover all sorts of treats. The Inner Peas snap pea crisps are my new obsession. Seriously. I have three bags of them in our pantry right now. They are the perfect balance of salty and crunchy and are low if calories and fat so they are a great guilt-free snack. I’ve seen different flavors of these carried at Whole Foods and I think Publix (for you Southerners), but the original is just perfection. 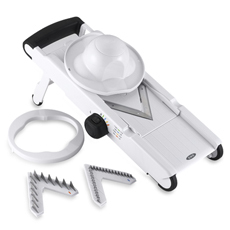 2) I will occasionally talk about a kitchen gadget I want. I love added fun new tools to our cooking collection, and I sometimes might want advice of if you have a favorite. Right now, I’m jonesing for a mandolin. Funny story actually. We got a mandolin as a wedding present. And I was all psyched to use it. Bring on the matchstick potatoes! But the first two times I used it, I cut myself so badly I thought I would need to seek medical attention. Yes, this was probably due to error on my fault, but I became so frightened of the mandolin, I trashed it. Well now, I am ready to conquer my fear. The above one is from Oxo and I’ve seen it talked about on other blogs. It looks a bit sturdier than the other one we had, so maybe my fingers will survive. I already know the first thing I’ll make when I get it — Sauteed Julienned Summer Vegetables from Skinny Taste. 3) Let’s talk about “Masterchef.” My mom and brother got me in to this show. I had never watched it until the current season. This week’s episode was a little over the top though, I will admit. They had all these live birds running around the kitchen and you kinda just maybe thought they were going to make the contestants kill the birds right there, but they didn’t. Phew. That aside, I love hearing Gordon Ramsay say “stunning” a million times an episode. My money is on Georgia girl Jessie to win. 5) Currently feeling the need to bake a pie. Specifically a blackberry one. This recipe from Saveur looks good. Anyone have another suggestion? And that is the first edition of Friday Five! What have been your favorites this week? As I mentioned in my introduction post, my husband Eric shares my love of food. I’ll be mentioning him a lot throughout this blog so I figured it would be good for me to tell you a bit about him. 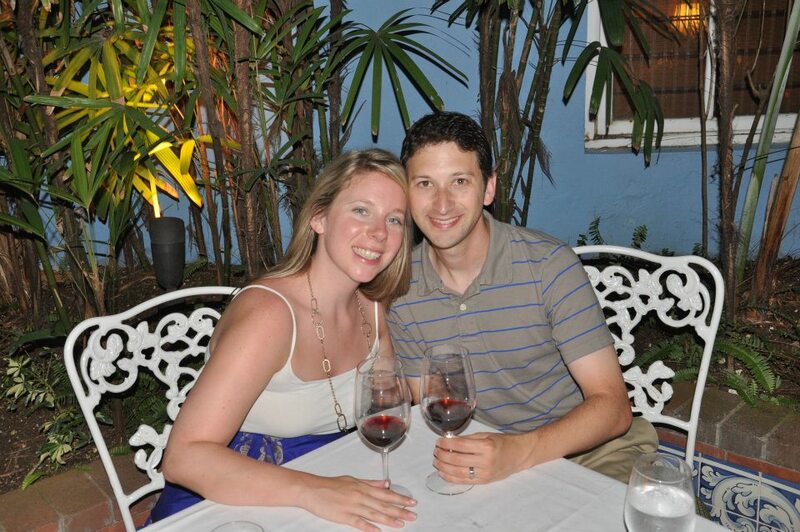 Here’s a picture of us at dinner on our honeymoon in Jamaica. Eric and I met in 2008 but didn’t officially begin dating until September 2009. The week of our first date, I remember him posting an album on Facebook full of food pictures from a trip to San Francisco. This guy showed promise. We’ve been together ever since. Eric is a great guy in many ways (obviously, I married him), but especially when it comes to our love of all things food. He is just as adventurous as I am when it comes to trying new things, sometimes even more than me. He’s open to trying new things that I cook (kale and quinoa for example), and his list of dislikes is pretty small (rare steak, onions, cooked mushrooms). Plus he’s a good cook too (and baker). He also understands my desire to photograph everything we eat, whether it is at home or a restaurant. It’s a small thing, but it would be annoying if every time I pulled out my phone to snap a pic, he let out a big sigh. Ain’t nobody got time for that. In fact, I sometimes think he is more excited about photographing food than I am. We had more pictures from our honeymoon of the food we ate than of the two of us probably. Together we like to explore new restaurants and try new things. We just relocated to Atlanta from DC in February and have since been working our way through Atlanta Magazine’s list of best barbecue in the city. In the four years we’ve been together, we’ve both developed a love of learning about wine. We got engaged while on a trip to wine country in California. Eric works part-time at a winery tasting room in Georgia (he also did it when we lived in Virginia). We got a wine fridge as a wedding present. We even hosted a wine festival at our house for a bunch of friends. I wouldn’t call us snobs, but we definitely enjoy a tasty bottle of vino every now and again. I’m pretty lucky to have Eric alongside me in foodie adventures. Who is your favorite person to talk food with? Why hello there. I’m Katy. Welcome to my new blogging endeavor, Kitchen Casual. Let’s start off with a little background. I’ve always loved blogging. I had a Xanga in high school, a LiveJournal in college and wrote a fashion blog called Thrifty Threads with some of my friends up until recently. I love having an outlet where I can go and write whatever I want whether people are going to read it or not. Once Thrifty Threads ended, I realized I was missing blogging in my life, so I decided to finally take the plunge and start a blog about food. Anyone who knows me in real life can tell you that I’m a foodie through and through. Both my husband, Eric, and I are. We are the people you see at restaurants taking pictures of every dishes. We’re the ones talking about dinner while we are eating lunch. We both love to cook, love to eat and love to experience everything about food. Food is my most fervent passion in life, so it made sense for me to start a blog centered around it. I wanted to start an outlet where I could share recipes, tips and tricks, restaurant reviews and a bunch of other random things surrounding food. Have you ever spent an hour watching Whole Foods hauls on YouTube? No? That’s just me. Well, fair warning: I’ll probably be sharing food hauls on here. I love reading them and watching them. They give me ideas of new things to try. And that’s what food is all about — trying new things. I want this to be a pretty casual blog, for me to keep up and for readers to follow, hence the title. I’m by no means a professional cook, but I do like to share what I produce in the kitchen. Most of the pictures I share will probably be via my iPhone and Instagram. I don’t have a fancy DSLR or anything. I document food the way a lot of people do: point and click on a cell phone. 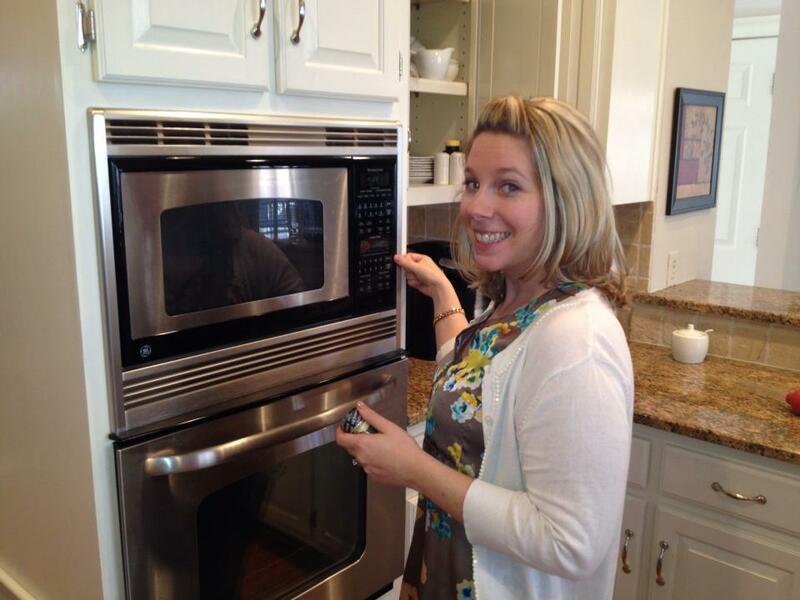 This is the one picture of me in the kitchen I could find on Facebook. Helping out with Thanksgiving dinner. My cooking philosophy is pretty simple. I love to cook delicious food that is easy to make and doesn’t take a long time. I love being in the kitchen, but I don’t want to be chained to the stove on any given day. I work a full-time job, so when the day is done, I like to throw some things together and have something on the table in about half an hour. You won’t see a lot of slow-braised, long-simmering posts here — unless they involved a crock pot. (Seriously, the crock pot is one of the best cooking tools around.) I can’t chop a perfect dice or create beautiful julienne veggies without the help of a mandolin. But I do try to make my food look nice. I have a graphic design background — I can’t help it that I like things to look good. I guess I will wrap this up. Bear with me as I work through the design and flow of this site. I hope to have it ironed out soon. But I have found blogging is an organic experience and things change constantly. So let’s see what happens. P.S. Follow me on Instagram and Twitter if you desire. I might post pics of our cat or tweet about Georgia football just so you are aware.